I cannot tell you how excited I was to find this e-book waiting for me in my inbox! I had just recently downloaded the I Wanna Be A Farmer from the WannaBe Series™ and we enjoyed that so much. This series comes complete with copywork, vocabulary, vocabulary worksheets, math worksheets, coloring sheets, and even a science experiment of making a robotic arm! 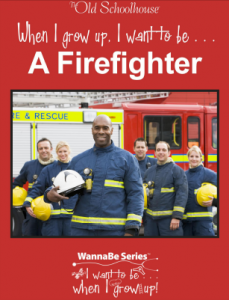 This is a complete unit study with everything you need for a fun time of learning about firefighters. I think the price of these are so wonderful too. It's loaded with 82 pages! Do not let that overwhelm you though. You can still pick and choose what you'd like to use. I would highly recommend this e-book. It is recommended for ages 4-10 but that could very easily be modified to span ages below or above. Jonathan (my 11 yo) was able to do further research with the links provided and used the book resource list to pick up some books from the library to go along with the series. We learned the salary of firefighters, job requirements, and some of the history of firefighting. Jonathan used the cursive copywork sheets and vocabulary sheets along with his brother Stephen who is 9yo. My daughter, Sarah (6yo), was not left out either. She used the manuscript copywork although she can do some cursive. I wanted to try all of it out =) And she was there as we went over the vocabulary. Here is a picture of copywork time. All of my kids give this a 2 thumbs up! And I certainly do because it fits our whole family! If you'd like to check out your own sneak peak go here. And to top all this off, for the month of May you can get the whole WannaBe Series™ for only $35.80!!! That's 10 e-books making each book only cost $3.58 each!! WOW!! I'll race you there! Disclaimer: I was provided a free copy of this e-book for review purposes. The opinions in this post are my honest evaluation of this product.